FileMaker Pro 12 is a very powerful application. As such, it also commands a steep learning curve. I’m a huge proponent of using built-in Help files within an application, but sometimes that just isn’t enough. If you use FileMaker Pro 12 (FMP12), I highly suggest you pick up a copy of FileMaker Pro 12—The Missing Manual. Authors Susan Prosser and Stuart Gripman, both FileMaker Certified Developers, have given readers a true manual to help with learning and mastering FMP12. As with all Missing Manual books, FileMaker Pro 12—The Missing Manual doesn’t need to be read cover to cover, but beginners should start with Part One: Getting Started with FileMaker. Databases have a lot of tricky jargon and concepts: fields, records, table view, form view, sort, data. By using simple language, step-by-step instructions, screenshots, and a touch of humor, Prosser and Gripman make understanding how FMP 12 databases are created and used a little less intimidating. Part Two: Building Your First Database will probably be the section you’ll refer to the most, at least until you become proficient with FMP 12. Here is where you’ll learn how to format your newly created database. Databases don’t have to look plain and boring. Customizing a database makes it not only much more pleasant to look at but easier to use. Did you know you can add a calendar or photos to a field? Make clickable buttons? Or change the font and font size of text? Or even create rounded borders? FileMaker Pro 12—The Missing Manual explains how. Databases are about relationships, how one piece of data is related to another piece of data in a different database. Part Two of FileMaker Pro 12—The Missing Manual continues by introducing the concept of relational databases, and why you would use them. Topics also covered include writing scripts, creating charts, using tab controls, and creating dynamic reports. For many people, the first two parts, covering four chapters, will be the most used portion of FileMaker Pro 12—The Missing Manual. The rest of the book is for the advanced FMP 12 users. Part Three: Think Like a Developer goes a little deeper into relational databases, layout mechanics and design, calculations, and scripts. If you’d like to become a power developer, read all about it in Part Four. Security and Integration is the theme of Part Five. FileMaker Pro 12—The Missing Manual closes with Appendixes: Getting Help, File Conversion, Using the Insert Commands with Container Fields, and FileMaker Error Codes. One of the features I really like with FileMaker Pro 12—The Missing Manual is that I can follow along in the book with my own FMP 12 database downloaded from the Missing Manual web site. As a FMP 12 novice, I found actually doing what was described, instead of just reading about it, was invaluable in understanding the complexities and nuances of FMP 12. I did notice a few errors throughout the book. Check here for corrections and updates. 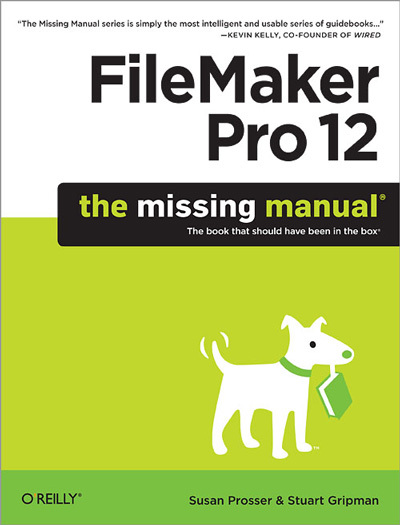 Overall, FileMaker Pro 12—The Missing Manual is a book all FileMaker Pro 12 users should own. Whether you’re a seasoned FileMaker user with years of experience or a novice who’s barely opened the application, you’ll be turning to this book time and time again.